BZA Bob's Zombie Apocalypse in 28mm: TOXIC WALKERS # 1. Another fairly quiet week here at the bunker, so I managed a little painting. As I mentioned last post, I've started the toxic zombies from the Zombicide season 1 expansion Toxic City Mall(TCM). My cultural mission is not stopping. This time we have a part two to last weeks fine example by Bryan Baugh. 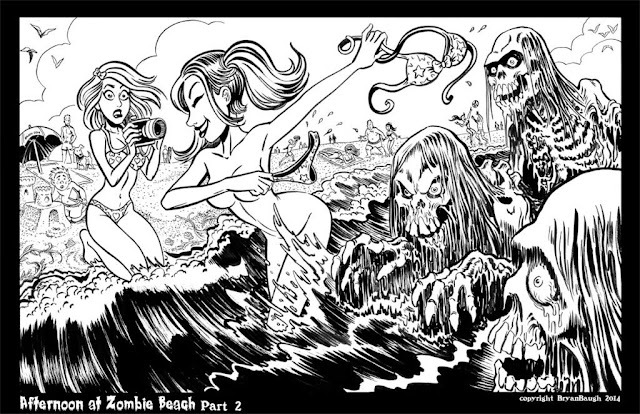 So, no surprise it's called Afternoon at Zombie Beach Part 2. Again no colour. Enjoy! 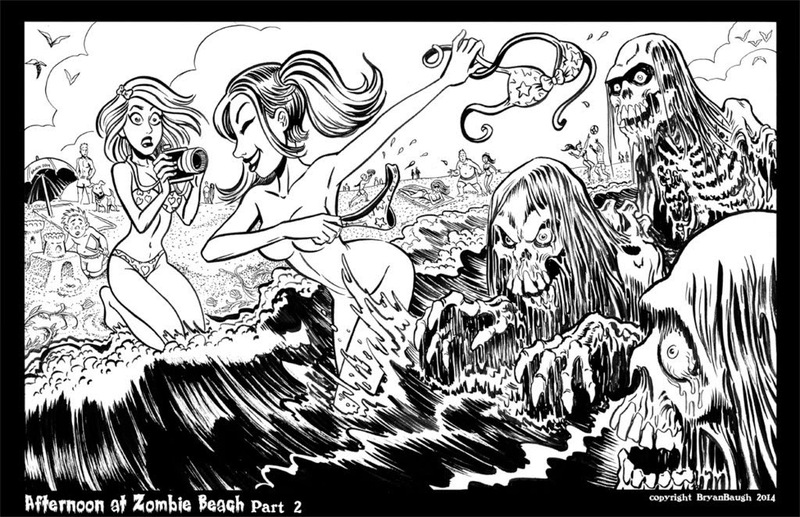 AFTERNOON AT ZOMBIE BEACH PART 2. Even though there is a colour guide for these guys, infact all the toxic zombies, in the TCM rulebook, I find that I can't stick to them. I've never liked being told what to do. What can I say? I wanted my toxic's green, so green they are. I just feel these colours make them more ....... icky? The bases have been edge painted bright green to denote them as toxic zombies. Luckily, they come in fours in the box, almost made for me to paint. BIT BORING, ALL THE SAME POSE. Some introductions are in order. From left to right as usual. Firstly we have Bedo a former steel worker. Next in line is Eurion a milkman before reanimating. Following him is Maelon a former member of the Cwmbran Massive. Finally we come to Tringad, unemployed before Z-day, now gainfully feasting on flesh. ALL THE SAME FROM THE BACK. I feel back in some kind of groove, so hopefully this painting thing continues longer than the last time. The plan is to finish the TCM zombies before moving on to anything else. We all know how long plans survive when they come into contact with the enemy, the enemy being real life in this case. I guess that's all I got for this time dudes and dudettes. 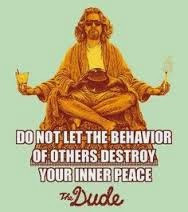 So until next time try and follow the DUDE and "take it easy". I was trying to give them a little variety without using grey skin. Green says toxic to me, so I went with it. Great stuff as always! You've managed to make them all very individual despite the same pose. These Toxic Zombies are a lot of fun to paint, Bob. You have done a marvelous job on them. I must admit that I was tempted to paint mine with green-hued skin but in the end I just copied the colour scheme from the rulebook. 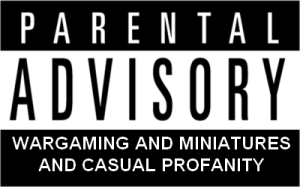 I'll be posting the first of my painted Toxic Zombies next week. I felt that green was the way to go Dude, I find that if I copy something it kinda cramps my vibe man. Really looking forward to seeing yours Dude! You know green is the black, right dude? New black, I meant new black. Looks great, Bob. Nice job on the greens and I especially like the (slightly) more natural skintone on the second from the left (Eurion). Clearly the lifeguard at Zombie Beach should be heavily armed to do his job properly. Eurion's flesh is painted with a paint from the Zombicide core paint set, it's called Zombie Skin. They are available seperately from Army Painter. The lifeguards need sniper rifles in their tower thingies, I'm sure that would help things along. Gives a whole new meaning to lifeguard though. High praise dude, high praise. Nice work dude your plowing through them this week! Making hay while the sun shines and the mojo's flowing dude. Done a really good job considering they are all in one pose. Keep it up! Luckily just four of each pose, in the first season it was eight of each pose. Talk about repetitive. Not really confident in my ability to convert these nice figures so will continue this course. Hey! That been a long time! Really cool painting job on your last minis. And i really like the style of the last illustrations. Where you been dude? 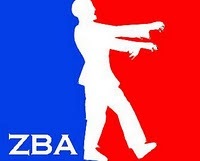 Still trying to post some interesting zombie art. What is not to like? Hehe nicely done mate! Clever idea for the base edge and lovely job on these Bob, bravo Sir. That is high praise indeed Sir.